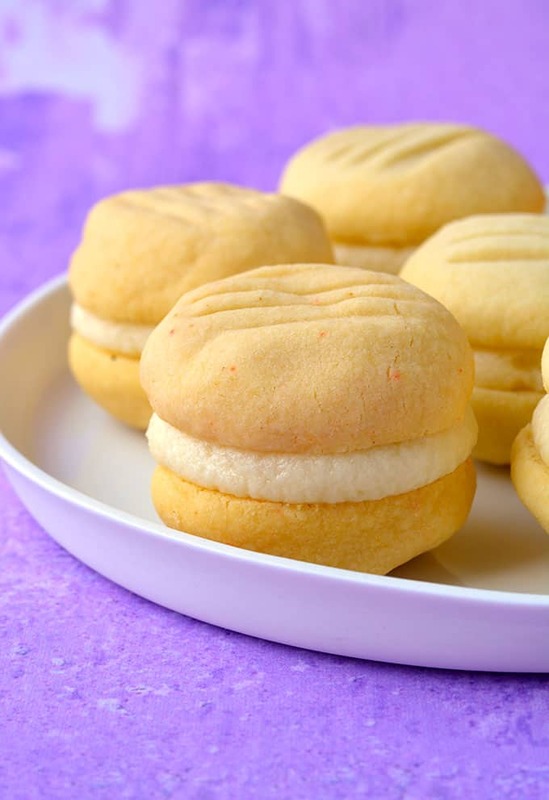 Fall in love with these four ingredient Melting Moments. 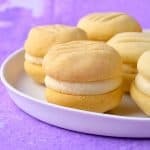 These buttery shortbread cookies are sandwiched together with creamy vanilla buttercream and make for a beautiful sweet treat. 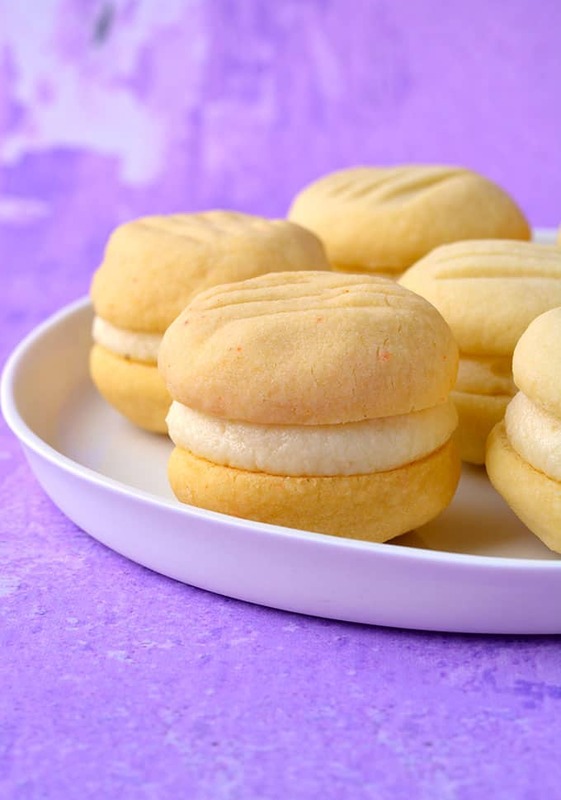 These gorgeous sandwich cookies are made of two shortbread-like cookies squished together with homemade vanilla buttercream. But they’re no regular shortbread cookie, these egg-free delights have a special ingredient that gives them unrivalled flavour. 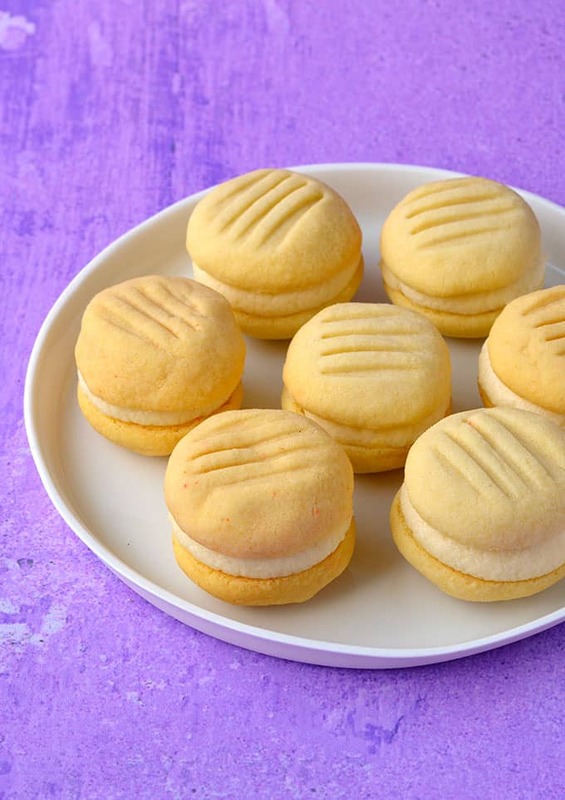 If you love buttery cookies, you will go mad for these Melting Moments. 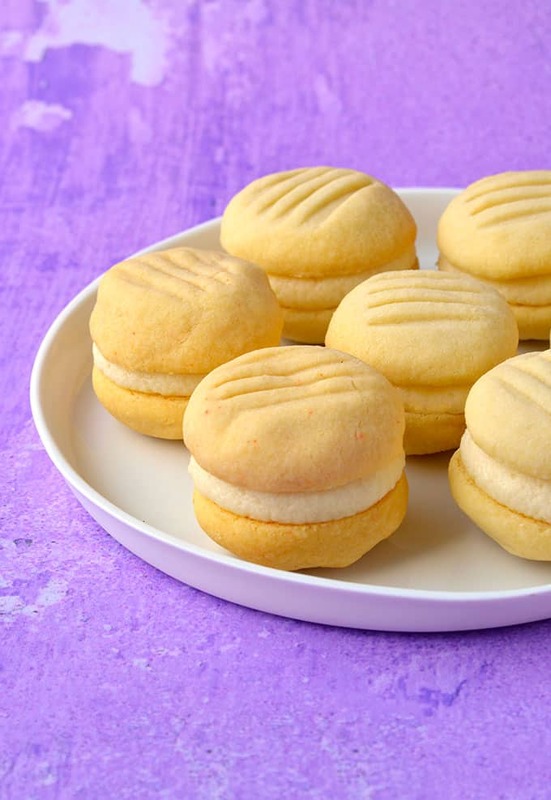 Ever since I was a kid, I’ve always had a soft spot for Melting Moments. In fact, I remember when I was first creating this blog, I even considered naming it Melting Moments. See – true obsession. And now I know why these plain-looking cookies taste so good. Made with butter, sugar and flour, there’s a fourth ingredient that takes them to the next level flavour-wise – custard powder. That’s also what gives them their typical yellow appearance. I know that custard powder may not be available in other countries as readily as it is here in Australia, so I’ve also given an alternative, that yields a result pretty close to the original. Trust me – I ate my fair share of Melting Moments just to be sure. There’s no eggs or raising agents, which means they are super simple to make. And they boast a unique buttery texture that means they literally melt-in-your-mouth -> get it?! The final touch is a smothering of creamy vanilla buttercream. You could also colour your buttercream if you like – wouldn’t these be cute with a blue or pink filling for a baby shower or the like? Made with staple pantry ingredients, these Melting Moments will become that recipe you have up your sleeve for when impromptu guests rock up or you need a sweet fix stat. Melting Moments are cooked when they are firm to the touch, but they won’t go brown like regular cookies. They usually take around 12 minutes to bake. How long do Melting Moments last? 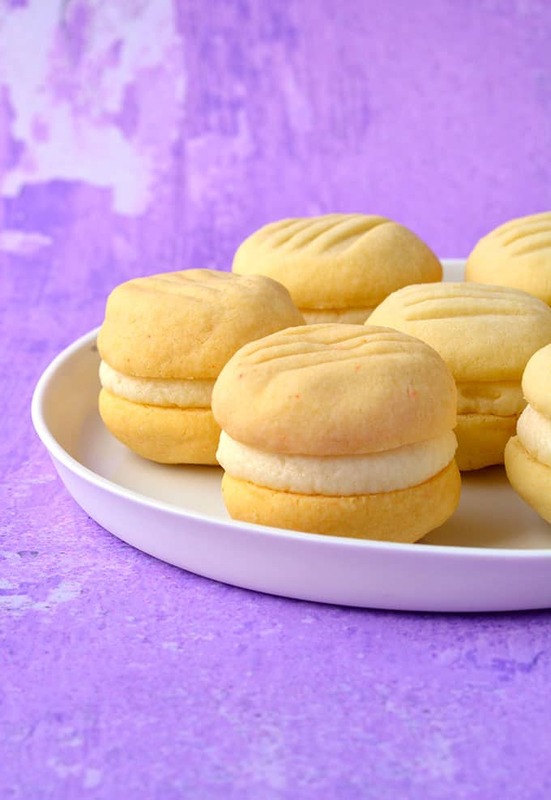 Melting Moments will keep well for up to 5 days. Store cookies in an airtight container. If you don’t have custard powder, you can use a mix of cornflour (or cornstarch) and icing sugar (or powdered sugar) instead. I’ve outlined in the recipe below how to make these Melting Moments without custard powder. Are Melting Moments gluten free? Homemade shortbread cookies filled with vanilla buttercream. Preheat oven to 180 C (360 F). Line two baking trays with baking or parchment paper. 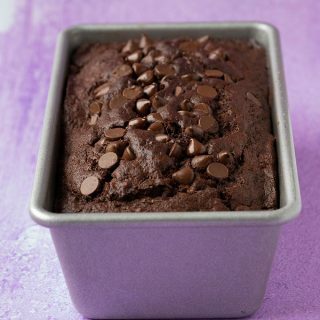 In a large mixing bowl, beat butter with an electric mixer for 1 minute or until creamy. 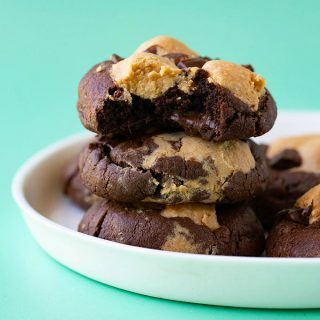 Add flour, sugar and custard powder and beat until a soft cookie dough forms. Roll roughly two teaspoons of cookie dough in your hands to form a ball and place on prepared tray. Repeat with remaining cookie dough. Press down on each cookie using a fork. Bake cookies for approximately 12 minutes. Leave to cool slightly before transferring to a wire rack to cool completely. To make the frosting, place butter in a large mixing bowl and beat with an electric mixer on medium speed until pale and creamy. Add vanilla, half the sugar and one tablespoon of milk and beat until combined. Add the remaining sugar and another tablespoon of milk and beat until smooth. 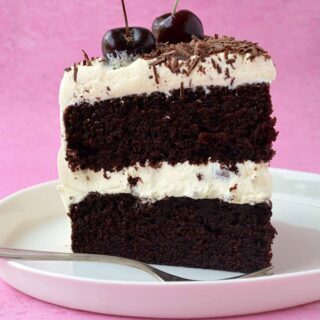 If the frosting is too thick, add an extra tablespoon or two of milk. Add buttercream to a piping bag fitted with a large round tip. Pipe buttercream onto one cookie. Add another cookie on top. Repeat with remaining cookies. *If you don’t have custard powder, add 3 level tablespoons cornflour (corn starch) and 1 level tablespoon of icing sugar or powdered sugar.